COATINGSPRO JANUARY 2017 39 e crew was off to the races with surface preparation. 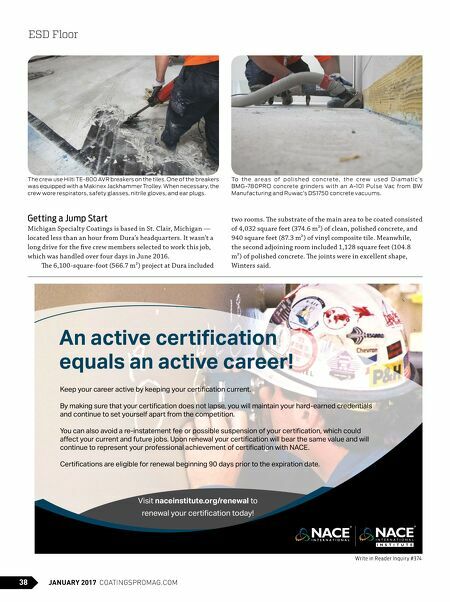 Wearing full-face piece disposable respirators with N95 and 3M's organic vapor filters, safety glasses, ear plugs, and nitrile gloves, the crew began by profiling the substrate to a Concrete Surface Profile (CSP) of 3. ey used Diamatic's BMG-780PRO concrete grinders in conjunction with an A-101 Pulse Vac from BW Manufacturing and Ruwac's three-phase DS1750 concrete vacuum (Winters' "Little Red "). "You need the big boys [vacuums] to stay with the big grind- ers," Winters said. To remove the tile portion, the crew used TE 800-AVR breakers from Hilti. One of the breakers was equipped with a Makinex Jackhammer Trolley. After preparation, the crew drove home to rest on a rainy night before beginning the ESD system application on day two. 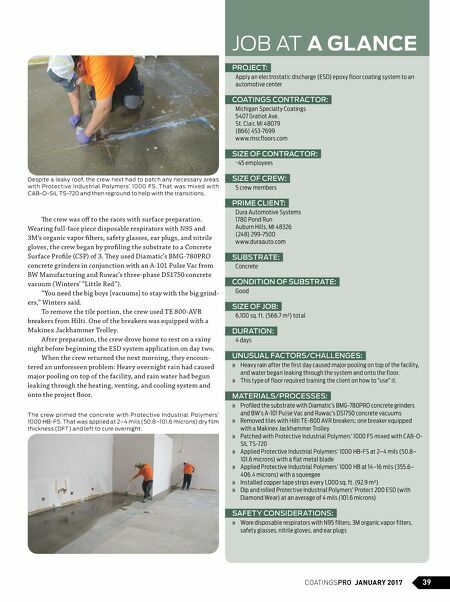 W hen the crew returned the next morning, they encoun- tered an unforeseen problem: Heav y overnight rain had caused major pooling on top of the facility, and rain water had begun leaking through the heating, venting, and cooling system and onto the project floor. JOB AT A GLANCE PROJECT: Apply an electrostatic discharge (ESD) epoxy floor coating system to an automotive center COATINGS CONTRACTOR: Michigan Specialty Coatings 5407 Gratiot Ave. St. Clair, MI 48079 (866) 453-7699 www.mscfloors.com SIZE OF CONTRACTOR: ~45 employees SIZE OF CREW: 5 crew members PRIME CLIENT: Dura Automotive Systems 1780 Pond Run Auburn Hills, MI 48326 (248) 299-7500 www.duraauto.com SUBSTRATE: Concrete CONDITION OF SUBSTRATE: Good SIZE OF JOB: 6,100 sq. ft. (566.7 m²) total DURATION: 4 days UNUSUAL FACTORS/CHALLENGES: » Heavy rain after the first day caused major pooling on top of the facility, and water began leaking through the system and onto the floor. » This type of floor required training the client on how to "use" it. MATERIALS/PROCESSES: » Profiled the substrate with Diamatic's BMG-780PRO concrete grinders and BW's A-101 Pulse Vac and Ruwac's DS1750 concrete vacuums » Removed tiles with Hilti TE-800 AVR breakers; one breaker equipped with a Makinex Jackhammer Trolley » Patched with Protective Industrial Polymers' 1000 FS mixed with CAB-O- SIL TS-720 » Applied Protective Industrial Polymers' 1000 HB-FS at 2–4 mils (50.8– 101.6 microns) with a flat metal blade » Applied Protective Industrial Polymers' 1000 HB at 14–16 mils (355.6– 406.4 microns) with a squeegee » Installed copper tape strips every 1,000 sq. ft. (92.9 m²) » Dip and rolled Protective Industrial Polymers' Protect 200 ESD (with Diamond Wear) at an average of 4 mils (101.6 microns) SAFETY CONSIDERATIONS: » Wore disposable respirators with N95 filters, 3M organic vapor filters, safety glasses, nitrile gloves, and ear plugs The crew primed the concrete with Protective Industrial Polymers' 1000 HB-FS. That was applied at 2–4 mils (50.8–101.6 microns) dry film thickness (DFT) and left to cure overnight. Despite a leaky roof, the crew next had to patch any necessary areas with Protective Industrial Polymers' 1000 FS. That was mixed with CAB-O-SIL TS-720 and then reground to help with the transitions.